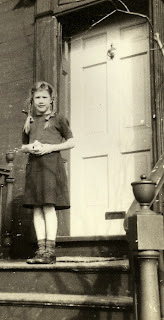 ...here I am on the front porch of 11 Fletcher Street in Portland, Maine. 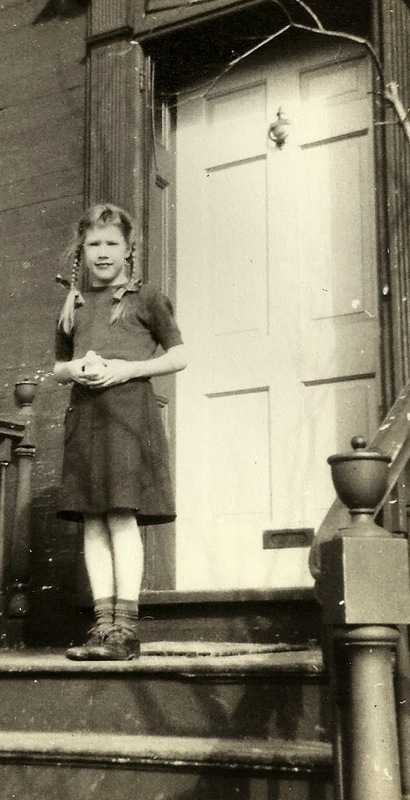 My family moved from Boston to Portland in the early 1950s. My parents bought this lovely old federal on Fletcher Street for something like $12,000; its market value today would knock my socks off. I could see the water from my bedroom window; I remember lying in bed, listening to my radio and watching fishing boats and the occasional tanker navigate the harbor. Later on, my parents gave me a window sill shelf-feeder, and I filled it with birdseed every morning before school...and watched birds at my window – inches away from me – sparrows and pigeons, mostly, but it was pretty magical! I’ve got my school clothes on: my wool skirt, little sweater top; the ribbons on my braids may or may not match the color of my underwear (I apparently picked ribbons that coordinated not with my outer clothing, but with my inner clothing – a habit that baffled my mother for a very long time!). I’ve got my sturdy brown leather shoes and striped socks...I still like striped socks, by the way. Like so many Federals (and Greek Revivals), the house on Fletcher Street had a heavy frame-and-panel Christian door, sometimes called a Cross & Bible door here in New England – the framing on the top four panels in the shape of a cross, on the lower two the spine of an open book. ...so if you’re ever in Maine, knock on my door and come in! What fun sharing some of your backstory. I wonder, since you're clearly all dressed for school, that possibly you're holding something for Show and Tell at school? My first thought just looking at the picture, before reading, was that you were holding a small gift for someone? I think I'm too old for Show and Tell, Karen...but the gift idea is intriguing...I'll have to think about that! Any luck yet on what's in your hand? I am just now catching up with all the posts and replies that arrived since I first posted! I hope your week is going good! It looks like you caught one of your pigeons, Deb! It does look kind of birdy, doesn't it, Kat? The color's too light for a pigeon, though; did we have rubber duckies back then? Oh, that's funny...can you imagine Grandma in Share Circle, lifting her skirts, say, or pushing up the sleeve of her sweater? It's a wonderful doorway, by far the finest I have seen on my trip through the posts this morning. And it is a fine photo as well. What you are holding is a piece of paper on which is written the answer to the thing I can't see in my Sepia Saturday picture this week! There's gotta be a way to enhance that sign! I love that so many Sepians are suggesting various solutions to that puzzle, Alan. Perhaps your sign really tells me what I'm holding here on the steps! You have painted such an evocative picture of growing up in your home in Portland, with some lovely memories. Portland was -- and still is -- a wonderful city: vibrant, creative. Funny that I should spend time there now, about 60 years after that photo was snapped! I love this post!! Thanks for the history. Thanks, Jackie...underneath it all, I think Sepians are ALL history buffs! Your history shines as brightly as the door which is impressive indeed. Oh, Bob -- how nice. Thank you. I don't think you are too old for show and tell. Oh, Jackie! Do you know about Flat Stanley? A fictional kid who gets flattened when his bulletin board falls on him -- he has many adventures; his parents mail him to various places! No, never heard of Flat Stanley - I'm going to go google him now though. Sounds like a fun story! If the knocker could talk! The birds at your window - of course that had to be magical. What a lovely memory! I remember the pigeons most clearly, Hazel...they cooed and talked to me...I was enchanted! A charming photograph - with its ‘little smile’ and all the details about your dress code too. It’s a wonderful door and those steps are leading us somewhere. Not quite a "Mona Lisa smile," but close to it! That was an education I would have never imagined, the reasoning for the shape of that door. I've always loved doors like this and never really stopped to think about the design. And you've reminded me of the tuna can I nailed to a porch railing at my apartment in Los Angeles. I was on the top floor and with that tuna can outside my window I had the joys of watching the birds come to feed as I sat working at my desk. Taking the door knocker with you is interesting, as is the name of the door design. Surprised you can't remember what you were holding but know that your socks would have matched your underwear though! Sorry, I meant your ribbons not your socks of course. Although I know only the "Internet Deb," the "Sepia Saturday Deb," it doesn't surprise me at all that THAT Deb matched her ribbons and underwear. I think you're holding a rubber duck. I'm laughing, Wendy...and I'm settling on the rubber duck theory, too! Do you mean that when your family moved from house to house they took the door knocker with them? That's amazing. You should write a blog post about that. Yup, they did! It's been handed down...seems a little "over the top" to me, but it's a family tradition. I don't have it on my door (it's a steel door), but I've got it!